Fluorescent lamps are very sensitive to changes in the surrounding air temperature. 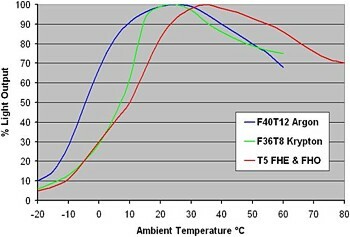 The graph in Figure F16 shows that peak efficacy is attained with an ambient temperature of around 25°C for the traditional T12 and T8 tubes, whereas the modern T5 products peak at 35°C. Note that the actual tube wall temperature will be somewhat higher than ambient – typically around 40°C for a T8 lamp in an ambient 25°C environment. A knowledge of these curves is of crucial importance when considering the lamp-luminaire combination to ensure maximum system efficacy. If the luminaire results in hotter operation, the lamp will fail to deliver the nominal luminous flux. Here the newer T5 tubes have a distinct advantage. They maintain their output better at high temperatures and deliver improved performance in modern, compact luminaires where higher temperatures are experienced. Conversely in colder outdoor applications such as exterior sign lighting, it is clear that both T5 and T8 tubes would offer very low performance levels. Here the T12 tube is generally the best option - although certain manufacturers now also produce T5 tubes specially optimised for low temperature operation. Care must also be taken especially in modern arrangements where luminaires are used as air-handling devices, to ensure that a cool flow of air does not cause the lamp efficacy to be reduced. Special linear fluorescent lamps have in the past been offered by some manufacturers with an Indium Amalgam filling instead of the usual pure mercury dose. This changes the vapour pressure of the mercury content so as to fine-tune the lamp for optimal output at high ambient temperatures, such as for instance in completely sealed luminaires where the tubes can reach rather high temperatures. This tube was first developed by Thorn Lighting in 1965 and subsequently Philips and Osram versions were produced. A more detailed overview can be found in Thorn Lighting Journal No. 3 pp.2-7.